Met vs MOMA: Which Museum is Best? When it comes to the Met vs MOMA you can’t go wrong. Both the Metropolitan Museum and the Museum of Modern Art are amazing museums. I have been to both museums many times and highly recommend that you also go to both if you can. 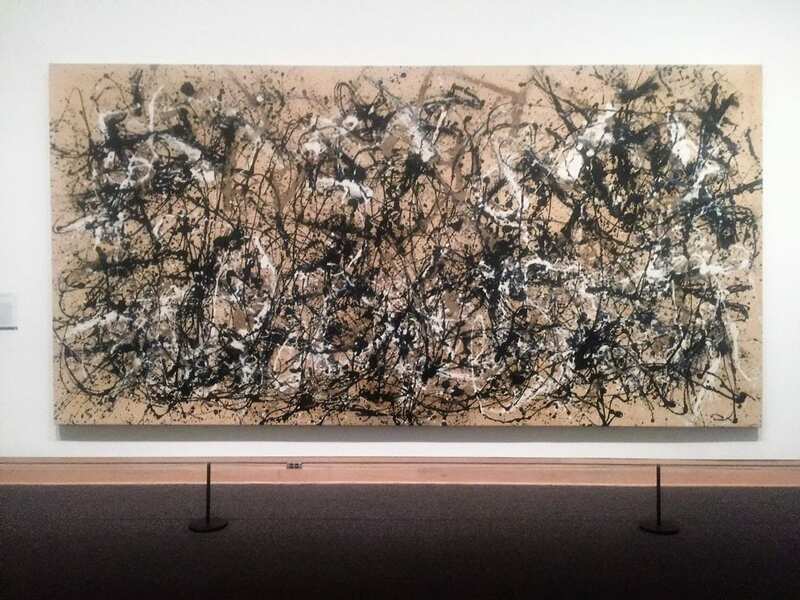 However, I know that sometimes you can only fit one museum in the itinerary especially on your first trip to NYC, so here are my thoughts on the differences between the Met and MOMA to help you choose. The permanent collections of these two NYC art museums overlap a bit, but the Met’s is much bigger. The MOMA focuses on modern art and contemporary art and they do it well! Seeing the collection of art at MOMA in one day is doable. The Met art galleries have such a broad range of pieces from ancient Egypt, to Medieval Art, to European Art, Modern Art, and more. It’s hard to say what the best Met art section is because there are so many great ones. I don’t think it is possible to see everything at the Met in one visit, probably not even in two. I keep finding new areas that I hadn’t seen on previous visits. 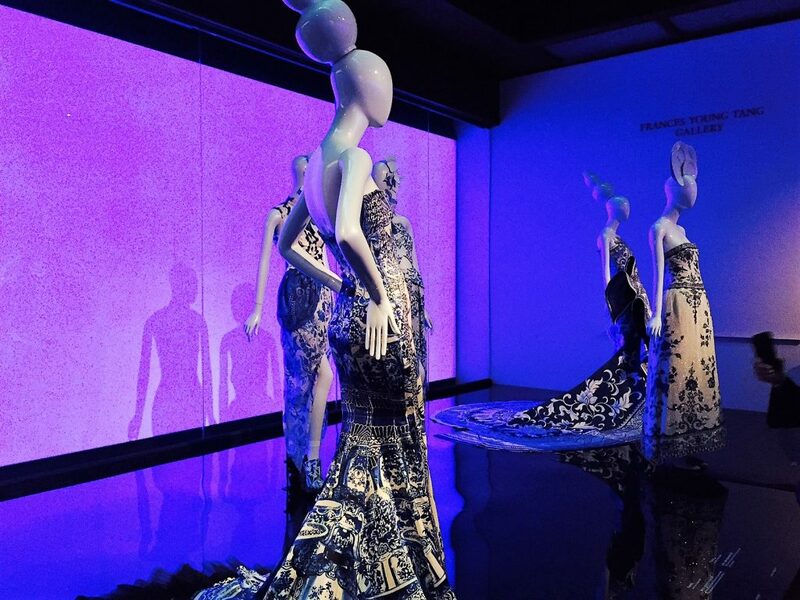 So based on the variety and size of the collection, the Met wins here hands down. Russell at the Temple of Dendur in the Met. The difference between MOMA and the Met is symbolized by their buildings. As you would expect, MOMA is a modern building opened in 2004 and that works well for a modern art museum. The building blends in with other buildings in midtown and if it weren’t for the large sign outside you might not even expect that there a museum inside. 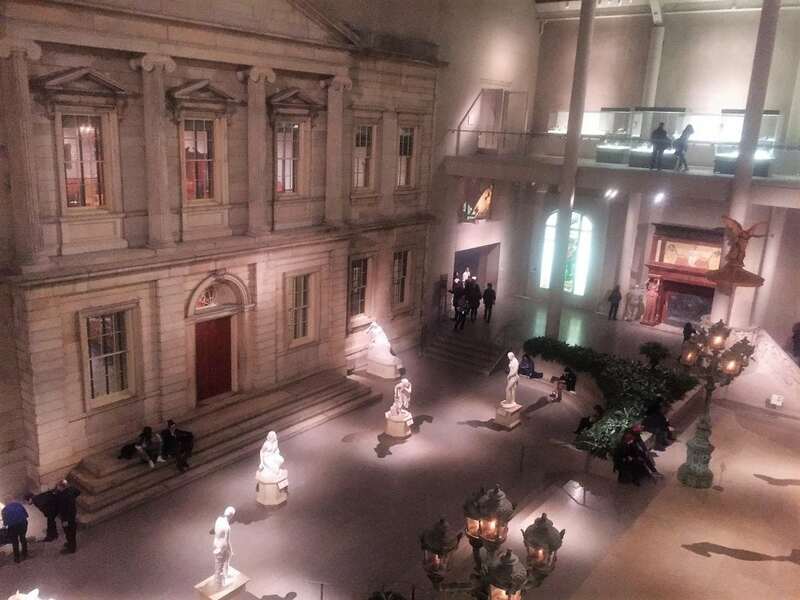 The Met, however, is housed in an iconic building that opened to the public in 1880! It has now expanded to cover more than 2 million square feet. Like I learned on my When Harry Met Seinfeld tour, the famous steps outside have been part of many TV shows and movies like Gossip Girls and Hitch. The Met is also home to the Met Gala, also known as the Superbowl of Fashion, which is held on the first Monday of May each year. My favorite type of art is modern art so I prefer to go to museums with that focus. Obviously, MOMA focuses on modern art, the whole building is filled with just modern art. During your MOMA visit, you will see their impressive collection including works by Picasso, Monet, Van Gogh and Warhol to name a few. I also enjoy the contemporary art at MOMA. Before I visited the Met, I thought the focus was more on Egyptian and classical pieces, but I should say I was also impressed with the collection of modern art at the Met. 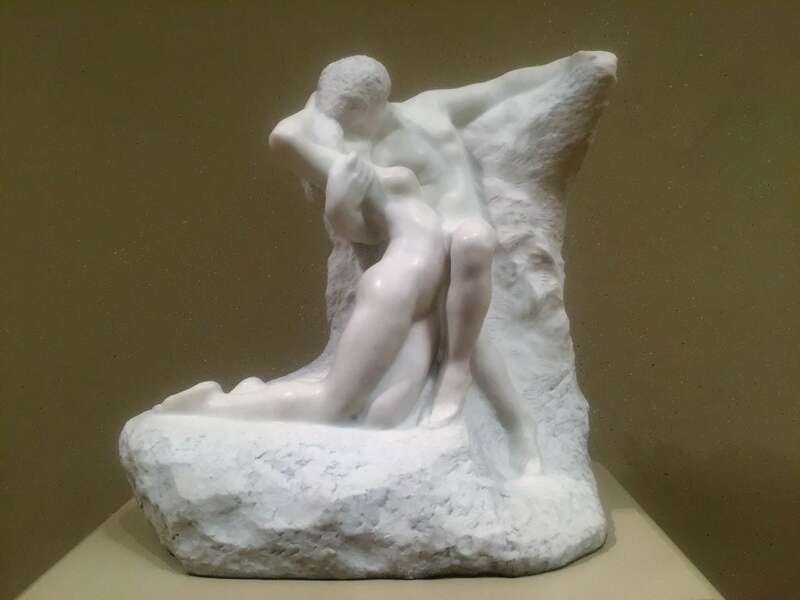 They also have pieces by Picasso, Monet, and Van Gogh, plus they have a nice collection from my favorite artist, Rodin, and more. Both museums have excellent special exhibits, that are constantly changing. Probably the most well-known special exhibit was the Rain Room at MOMA. Unfortunately, I never got to see the exhibit because the lines were always so long! I have fond memories of several of the special exhibits I went to. I enjoyed the Tim Burton exhibit at MOMA, it was an interesting insight into his thinking and his life. At the Met, I enjoyed the China Through the Looking Glass Exhibit, which showed some of the Asian influence in fashion. In Manhattan, outdoor space is precious and both museums have it. MOMA has a sculpture garden that is open year around. 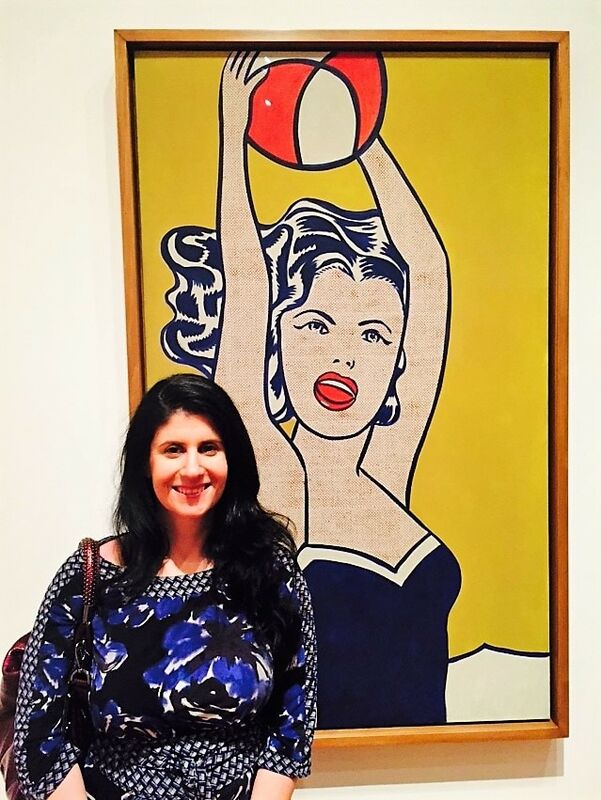 One summer I attended the MOMA party in the garden and it was a lot of fun. It’s also a great spot for photos when the weather is nice. The Met has a rooftop that is open in during the warmer weather months. (May through late fall, weather permitting). Since the Met is located on the edge of Central Park, the view of the park and the midtown skyline is definitely Instagram-worthy. The Met Rooftop has a different art exhibit each year. The Met Rooftop is open from 10 am – 4:30 pm during the week (except it is closed on Mondays) and until 8 pm on Friday and Saturday. There is a Martini Bar on the Met rooftop that is open Friday and Saturday from 5:30 pm – 8:00 pm. If you are visiting the Met during the Summer make sure you save time to check out the roof. 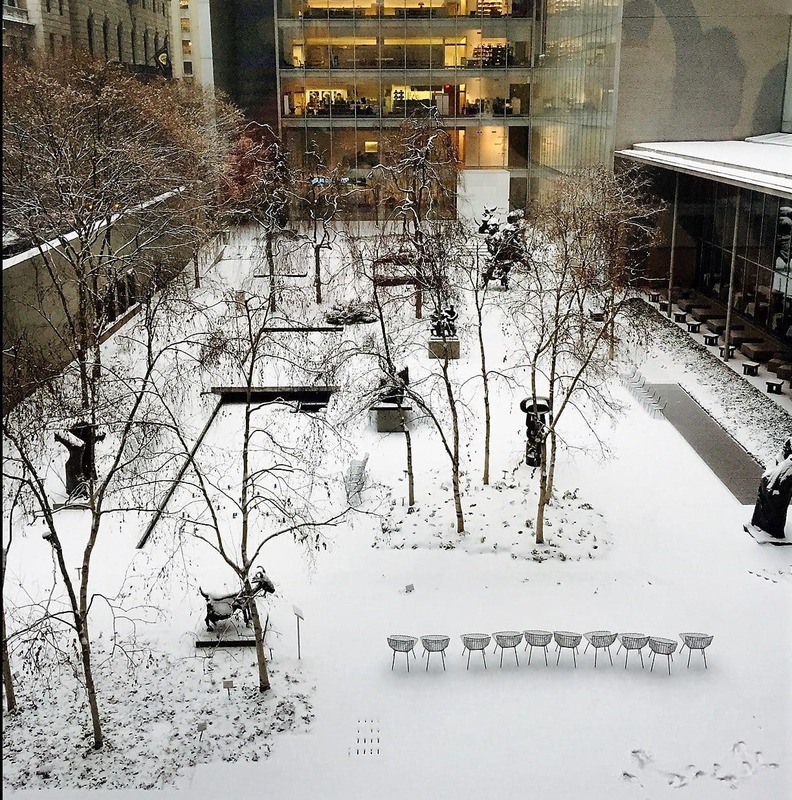 The MOMA sculpture garden covered in snow! You can find some great food options at either MOMA or the Met. MOMA features dining options by Danny Meyer’s Union Square Hospitality Group, including The Modern, a contemporary American fine-dining restaurant that holds two Michelin stars, and museum cafés, Cafe 2 and Terrace 5. The museum cafes are for museum guests only and do not accept reservations. I have eaten at the MOMA cafe on the 2nd floor a few times and always enjoyed it. You do not need to be a museum guest to go to the Modern, it is pricey though. I am a big fan of Danny Meyer’s restaurants and the cafes in MOMA are great too! Given the museum’s location in Midtown, there are also several cafes near MOMA that you could go to for lunch. I like La Bonne Soupe and PizzaArte on 55th St between 5th and 6th Avenues. If you are in the mood for a burger and crazy shake, Black Tap on 55th is also pretty close. On the weekends, I love Rue 57 for brunch near MOMA. Anisa and Russell on the Met Rooftop with midtown Manhattan in the background. The Met has several dining options too. The Dining Room at the Met is the fine dining option. Even though it is located inside the museum overlooking Central Park, you don’t have to purchase admission to the museum to dine there. They have participated in Restaurant Week, so that could be a could time to try it. They also have several casual options including the Balcony Lounge, The Petrie Court Café, The American Wing Café, and the Cafeteria. You can also get light bites at the Rooftop. If you are bringing kids along with you, you may wonder which museum is best for kids. Luckily, both the Metropolitan Museum of Art and MOMA have special programs for young visitors to keep them interested. I think kids would be most excited about the Egyptian section of the Met. 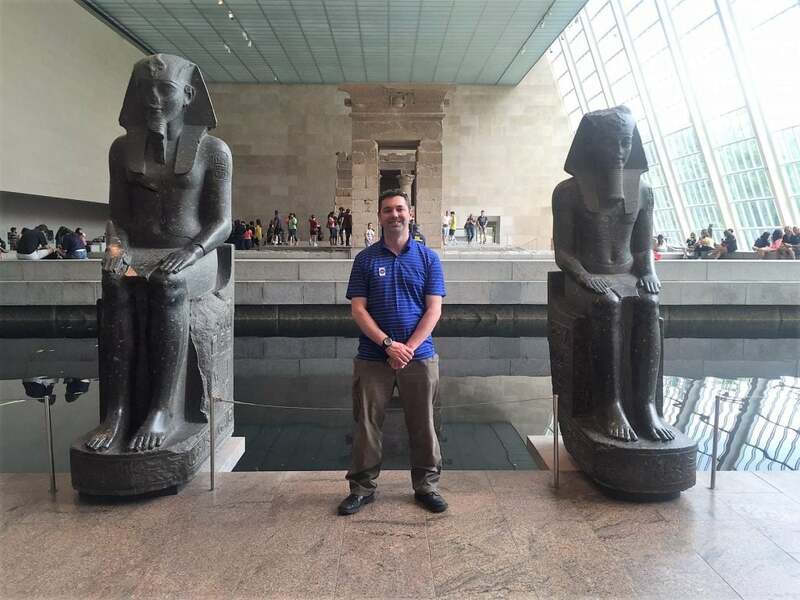 Walking through the Temple of Dendur will make them feel like they have been transported to ancient Egypt! Both the Met and MOMA have mobile apps supported by Bloomberg Philanthropies that you can download on your phone for free. The MOMA app was recently simplified and is now more like an audio guide where you can get more information about the artwork you are seeing. The Metropolitan Museum of Art App is more comprehensive and includes maps, information about events, a link to buy tickets, and a section for Met Museum members. Information about the Met Cloisters and the Met Bruer are also included in the Met Museum app. NYC MOMA is open seven days a week from 10:30 am to 5:30 pm. During the summer, they are open until 9 pm Thursday-Saturday. The Met is open 10 am – 5:30 pm Sunday through Thursday and from 10 am – 9 pm on Fridays and Saturdays. So during the summer, MOMA has better hours, but the rest of the year, the Met has better hours. Both museums are popular so the best time to go will be during the week in the mornings. Since MOMA is a smaller museum, it will feel more crowded than the Met. When the weather is bad, the crowds will be bigger at both museums. If you are worried about the crowds, check out this VIP tour that allows entry to MOMA one hour before it opens to the public. There is a similar option for the Met Museum that allows you entry 90 minutes before the public – click here to check price and availability. The Met was pretty quiet after dark. The MOMA Museum New York is conveniently located at 11 West 53rd Street in Midtown, only a block from the 53rd street stop on the E and M subway line. Alternatively, Times Square or Grand Central to MOMA is about a 15 minute walk. The Met is located at 1000 5th Avenue on the Upper East Side at the edge of Central Park. You will most likely need to take the 4,5, or 6 subway to 86th Street and walk 15 minutes or take the bus. Below is a comparison of the regular admission prices as of 1/24/19. At face value, the prices look pretty similar. However, the regular admission price for the MET is the amount you will pay (plus a $1 fee per ticket) if you buy your ticket online. But don’t buy your ticket online! If you buy your ticket at the museum, you are actually able to name your own price (see change to policy below). They will ask you how much you want to pay and it is fine to say something lower than the admission price. Also, I should mention that with your admission to the Met on 5th Avenue, you also get same-day admission to the Met Breuer (closed on Monday) and the Met Cloisters. Note New Met Admission Policy Effective March 1, 2018: The pay-as-you-wish policy will continue for New York State residents and students from across the tristate region (NY, NJ & Connecticut). Visitors from outside New York will be required to pay mandatory admissions and admission for children under 12 will remain free. Your full-priced admissions tickets would give you access to all three Met locations for three consecutive days. The MOMA entrance fee is fixed and not a recommended price, but every Friday evening, 4:00 pm–8:00 pm (and until 9:00 pm July 1–September 2), admission is free thanks to UNIQLO! If you want to go to a MOMA free Friday, please go early as it is very popular and there will be a line. Both the Met and MOMA also have different combination passes with other attractions that will save you money. The RockMOMA ticket saves you $7 on admission to MOMA and the Top of the Rock Observation Deck. Additionally, both museums are part of the New York Pass which includes admission to 100+ Attractions in New York (Click here to see all the attractions included). NYC attraction passes are a great way to save money sightseeing in New York City! Jackson Pollack at the Met. For me it’s a hard choice, I love MOMA because my favorite type of art is modern, but the MET has so much to offer. Ok, so I want to hear your thoughts, the Metropolitan Museum of Art or MOMA, which one would you choose? Visit both the Met and MOMA if you have time! If you are visiting NYC and want to see several attractions, you can save money by purchasing the New York Pass, New York Sightseeing Pass, or New York CityPass. 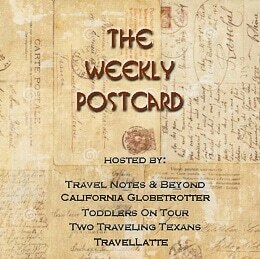 We are happy to co-host the Weekly Postcard Linkup. Everyone is invited to join us and share their travel blog posts here beginning at 12 p.m. (PST) / 8 p.m. (GMT) Friday, July 28th. I love MoMA! There’s always some really interesting and thought provoking exhibits and I really like the contemporary art stuff. Plus there’s a good sushi restaurant close by. Yes the MOMA is a great museum! I love the contemporary stuff too! No contest, the Met. But then I have given up trying to appreciate most art after the Surrealists. I will be perfectly happy if I never see another Picasso. Of course, I will also be perfectly happy if I never see another St. Anthony full of arrows. And my real preference is for arts and crafts rather than fine art – think the V&A in London. Yes I know I think modern art is something you either love or hate. I did really like the V&A museum too. Hey! Glad to see you’re keeping up with your posts (unlike me..) and this was really interesting for me cos I’ve been to the Met but never to MOMA. My husband hates modern art, so we’ve never been, but now I’m thinking that I should just go visit it myself the next time I’m in NYC 🙂 The Met is indeed amazing! How many trips did it take you to see all of it (if you have)? Michelle – So nice to hear from you. I hope you are doing well. I know a lot of people don’t like Modern Art, it is one of those things you either love or hate. I don’t even know how many times I have been to the Met. I think I have seen most of the museum? I take out of town visitors there a lot so tend to take them to see my favorite areas. So I don’t necessarily see new areas anymore. 2 million square feet??? Really??? Wow! That’s all I got Wow!! Ok, I love how you structure your posts. I love the way you so often do a there’s this and there’s that and here’s my conclusions. It’s great! I have not had the good pleasure to visit NY yet, but if and when I make it there, I’m gonna be so prepared. Wow. 2million square feet. I can’t imagine. I could spend a week! Awe thank you Amanda! Yes the museum is huge and I could spend days there. I hope you make it to NYC soon! Ruth – Yes, I am not sure if I have even seen everything and I have been so many times, I can’t count! I am NOT a museum person. AT ALL. Unless there is an artist I specifically want to see, like Jackson Pollock, or something to do with WWI/II. I just cant stand the sloooooow pace of moving around. It hurts my feet. #TheWeeklyPostcard! Lolo – Yes as a kid I hated museums too, but I have really come to appreciate them. I tend to go through museums faster than most people though. The Met is the hands-down winner for me as I like that is has so much to offer. I like ancient and classical art as well as the interiors of famous homes etc. The one thing I don’t like about the Met is that it was really crowded when we were there a month or two ago and there were lines just to see some of the exhibits but at least you can move to less crowded spots since the museum is so huge! But I think as you say, it really depends as modern art lovers would definitely want to se MOMA and probably try to visit both since the Met also has a fantastic modern art collection. Jessica – Yes ideally I do think everyone should try to visit both, but I know that’s not always possible. Both museums, unfortunately, do get pretty popular. I recommend trying to either go early or late if you want it to be less crowded. This is such great info! I’m heading to NYC soon and have never been to either! Marisa – Glad you liked it. I have a few other posts that you might find helpful in planning your trip to NYC. I’ve been 10 years ago to NY for 2 days, but I never entered into a museum. I walked around the whole time, like a lunatic …I even lost 4 kilos. Gabriela – Thank you! There is so much to see in NYC I can understand why you didn’t have time to see any museums. You definitely need to go back, hopefully for a little longer! This is a great comparison! I’ve never been to MOMA, but in general I prefer smaller museums for the more intimate feel and less hectic experience. I much prefer Musee d’Orsay over the Louvre! Melissa – I agree you would probably like MOMA better. Glad you enjoyed the post. My home town!!! I love both and have been to both many times as well. I think both are great but just depends on your taste. I like the MET more just because it has such diversity and I love the Cloisters. Great tips and great info!! Kelly – Glad you enjoyed the post. Yes the Clousters are nice too. I only went once though. I must admit, I’m a MOMA girl if I had to choose. Great article to help any struggling visitors make a choice which suits them best. Fay -Thank you. Luckily you can’t go wrong with either! This is a GREAT comparison article! I must admit although I’ve been to New York a handful of times I’ve never given myself time to really explore all the amazing museums and experiences it has to offer. I love MoMA but will definitely have to get to the MET one day! 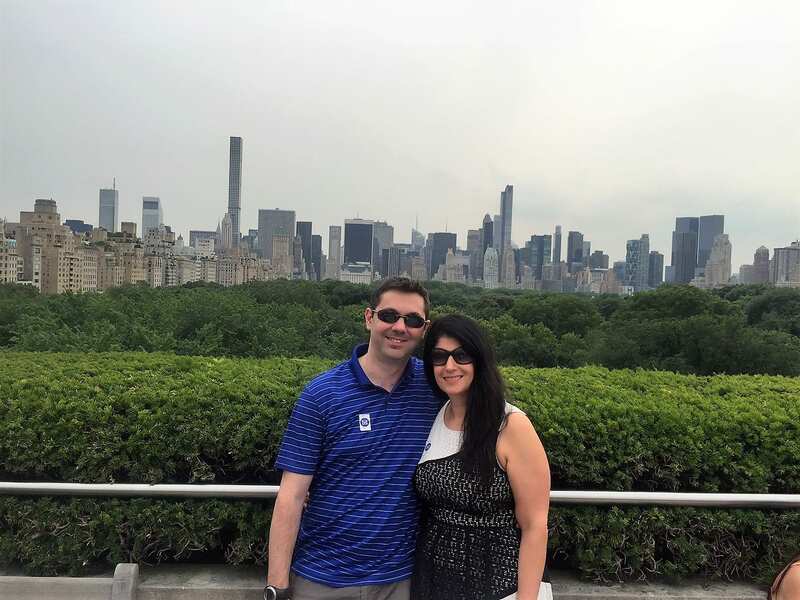 Rebecca – There is so much to see in NY so that is understandable. Hope you make it back soon. So glad you enjoyed the post. Yes, I do really love the Met Rooftop. It is only open during the summer though. So glad you found the post informative. I’ve been to the Met twice but still I don’t think that’s enough time! There are so many things to see! This is nice to have a comparison of the Met & the MOMA – I’ve never been to the MOMA but knowing there’s a Tim Burton exhibit??!? Now I need to go!!! Alicia – I agree you can never have enough time at the Met. The Tim Burton exhibit was a few years ago, but MOMA does always seem to have really interesting special exhibits! Anda – Yes it is a hard choice. I agree museums are great in the winter. I hope you make it back to New York soon! Hilary – Thanks so much, so glad you enjoyed the post. It’s so hard for me to choose! The China through the looking glass exhibit was really good, but MOMA has had many great exhibits too! I’ve only been to the Met. Overall, the family is not a huge fan of modern art. On the other hand, I like Monet, Van Gogh, Picasso and Warhol, so perhaps I would have enjoyed the MOMA after all. We ended up at the Met because of the broad scope of its collection, especially the Egyptian art. I’d love to visit New York again so that I could give the MOMA a try. Michele – One of my favorite things at MOMA is the huge Waterlilies painting by Monet. I do think you would also enjoy MOMA. I hope you make it back to NY soon. This is a tough choice! I have been to the Met a couple of times and it’s just amazing. However, if I only have time for one museum during my trip to NYC, I usually go for the MOMA. I am really into modern and contemporary art and the temporary exhibits are usually very interesting. I also saw the one about Tim Burton and it made me appreciate his work even more. Bianca – Yes I love modern art and contemporary art too. I really loved the Tim Burton exhibit and agree with you, it made me appreciate his work more too. Yes, ideally everyone should go to both museums. They are both fantastic. The Tim Burton exhibit really was something special. I’ve been to neither as I’ve never been to NYC, but I’d love to go to both. Will definitely use this guide when I finally get the chance. Thanks David. You will love New York. So much to do and so many great museums.